Nicole Miller beaded dress (sample), Coach leather vest (similar here), Vintage belt, Highline duffle c/o Deux Lux (just seen here), H and M feather ear cuff, Plomo gladiator platform sandals. Outfit shots by Erica Lavelanet. Runway shots by me. What a fabulous blur of a weekend! It all started with a fun-filled, easy-going Friday, when I was lucky enough to take off work to catch some shows. My day started with an early champagne toast at The Highline Hotel, where a friend at Town & Country magazine was hosting a decadent pampering and beauty suite sponsored by Estee Lauder, followed by the runway shows of two of my favorite designers, Rebecca Minkoff and Nicole Miller, and capped off with a cocktail party at the French Connection store in Soho. Taking into consideration the blazing heat (it was about 90 degrees out and super humid) I opted for this lightweight, silk, beaded dress that I borrowed from Nicole Miller, layered with a leather vest and accessorized with a pair of sky-high platforms to give it some added edge. I'm not usually one for girly accents like sparkly beading, embroidery or glitter, but given the glam occasion I decided I'd give it a go. For me, the key to trying out new styles is to pair them with trusty wardrobe staples that I love and feel great wearing, and this vest is definitely one of those essential items. 1. 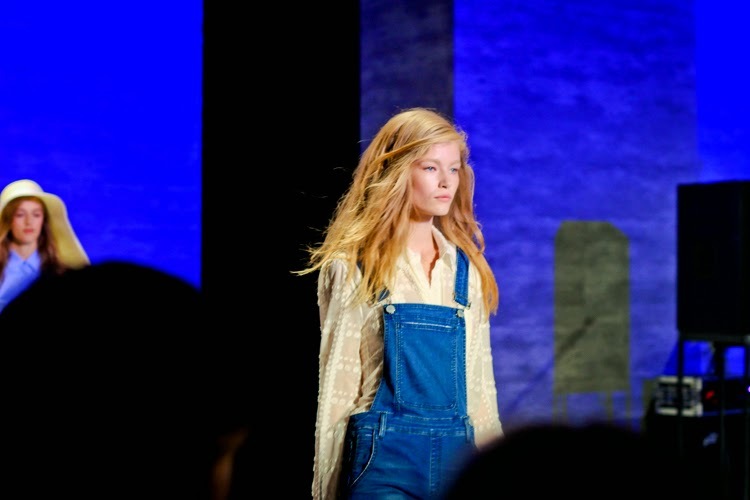 Obsessed with these perfectly fitted overalls paired with a delicate lace blouse at the Rebecca Minkoff show. 2. 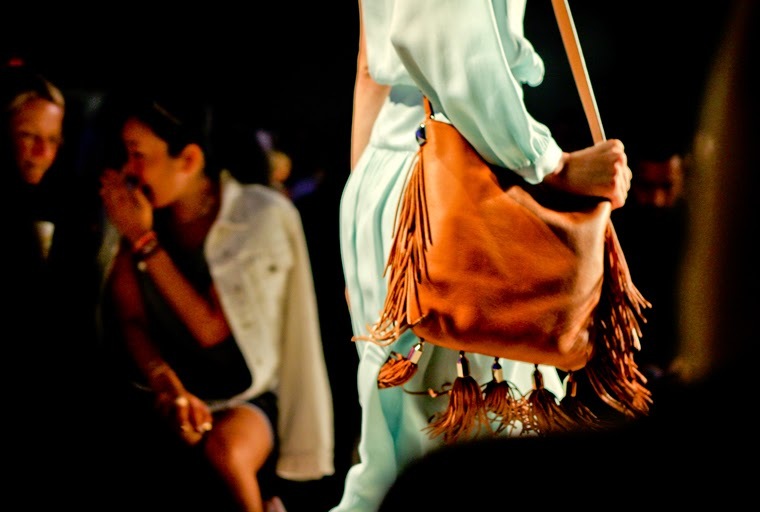 True to form, Rebecca Minkoff's runway was filled with to-die-for leather handbags and shoes. 3. Another shot from Rebecca Minkoff, featuring delicate lace and embroidery that made me crave Summer again. 4. One of my pics from the tropical Nicole Miller show, which was inspired by a jaunt to Rio de Janeiro and featured a fun printed runway reminiscent of the sidewalks of Copacabana. 5. 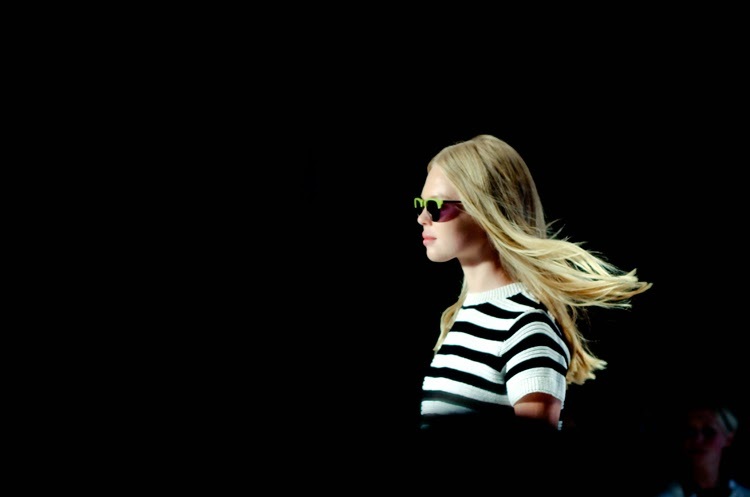 I loved the retro look of Nicole Miller's models, donning mixed prints and colorful half-frame cateye sunnies. Check out this full look here. 6. Legs for days during the Nicole Miller finale. The kaleidoscopic, patchwork print on the shorts and dress I snapped here was one of my faves. Very nice outfit! I´m in love with the sandals! that dress you're wearing is gorgeous! Love the Minkoff overalls look, and your heels are so beautiful! you look amazing! that dress is so beautiful! Sounds like such a fun weekend! In love with that dress! The beading detail is too pretty!